The proper way to store Pu-erh. This variety of tea is grown in the Yunnan Province of China. It is taken through an in-depth fermentation process that ages the leaves. This dark tea is fermented and oxidized before it is dried and rolled. Once the tea has undergone the entire process, it is packaged for sale. Since there are so many environmental factors that go into the making of Pu-Erh tea, it is important to be aware of requirements when storing the leaves. Different factors in your home such as temperature, humidity, and aromas can change the flavor of the brew. Here are some things you should do to store your Pu-Erh tea properly. The leaves can absorb strong odors that waft through the air nearby. For example, you wouldn’t want to store Pu-erh leaves in an enclosed space where you keep onions. The smell of onions is very strong and any porous food items can absorb the scent. It would also be unwise to store the leaves in a spice cabinet for the same reasons. If the leaves absorb strong aromas, this will change the flavor of the brew. You wouldn’t want tea that has a hint of rosemary or basil. Many vegetables and spices do not fare well when exposed to direct sunlight. Pu-Erh tea is the same way. The flavor of the leaves can change and make the tea taste bitter when you steep it. Be mindful of placing the tea out on counters that receive a lot of sunlight. Place the box in a dark location in your kitchen. The leaves require a fair amount of airflow in order for the tea to age properly. 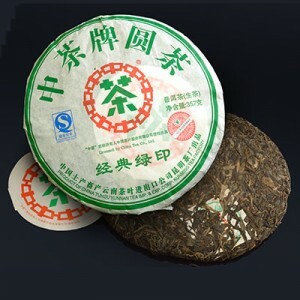 Pu-Erh tea will continue to age even in the storing process. If you do not allow enough air to get to the leaves, it can drastically affect the flavor. Be aware that storing the leaves in plastic wrap or an air-tight container will do the tea leaves no good. While it might keep the leaves from absorbing odors, the plastic will cause the tea to taste badly. It is best to put the leaves in a paper box or paper bag. These types of materials will allow the cakes to receive the air necessary to keep the aging process in-check while you store Pu-erh. It is important to note how much temperature can affect the aging of Pu-Erh tea. High temperatures will result in undesired flavors. Low temperatures can stop the aging process, which will also result in undesired flavors. Some will argue that if the storage temperatures fluctuate, the flavor can be affected. Either way, it is best to moderate the temperatures of the storage area in order to allow the tea to continue aging without becoming overheated. It is best to keep your tea stored in an area that has 60 – 85% humidity. When water accumulates on the leaves, it can cause mold to grow, which will ruin the flavor. Humidity greater than 85% may also adversely affect the flavor, even if mold does not grow. Keep the leaves dry and at a moderate temperature. If you have a lot of humidity in the air where you live, run a dehumidifier to regulate the humidity. Some think that too much fluctuation in humidity can also affect the flavor. In order to keep your Pu-Erh tea from spoiling during storage and to ensure that you properly store Pu-erh, these factors should be considered. The storage environment has everything to do with how these leaves will taste over time. The optimal age for each tea cake to reach will depend upon many things. It should not be determined solely on the duration of storage. The actual storage process plays a huge role in developing the flavor of this complex tea. I love this article. pu erh tea is really worth discovering. Thanks much for sharing.